Pass Your Exam with a Machine Learning Exam Preparation App That Offers Video Courses, Realistic Practice Exams, Practice Quizzes, Certification Forums, and Thousands of Exam Questions for Today's Popular Courses for AWS, Cisco, and CompTIA. Based on the figure, which of the following IP addresses will the server respond to? Refer to the figure. Which answer correct shows the shortest valid version of this IPv6 address? Which of the answers correctly shows the EIGRP command that is used to alter the metric to only use the bandwidth of the path between a device and the destination network? Refer to the figure. What information can be derived based on the information shown? Only classful addresses will be redistributed. This router is in a stub area. Some routes from EIGRP will use a metric of 20. All routes from EIGRP will use a metric of 50. 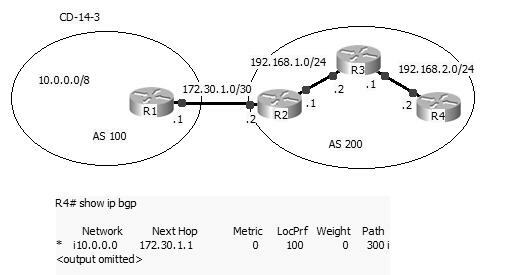 Refer to the figure; assuming that both R4 and R5 were configured with the command redistribute eigrp 20, what would be the metric of the route for 172.16.1.0/24 from R1? None, the route would not exist. Which of the following must be enabled on a router to use Unified Reverse Path Forwarding (uRPF)? When configuring a Spoke router in an EIGRP network, what is the easiest way to limit the Spoke routers from advertising remotely learned routes to the Hub device (or devices)? Refer to the figure; a device configured as shown would be using what BGP router-id? Which routing protocol when used with any other routing protocol defeats many common multihomed redistribution problems with its default configuration? Refer to the figures. 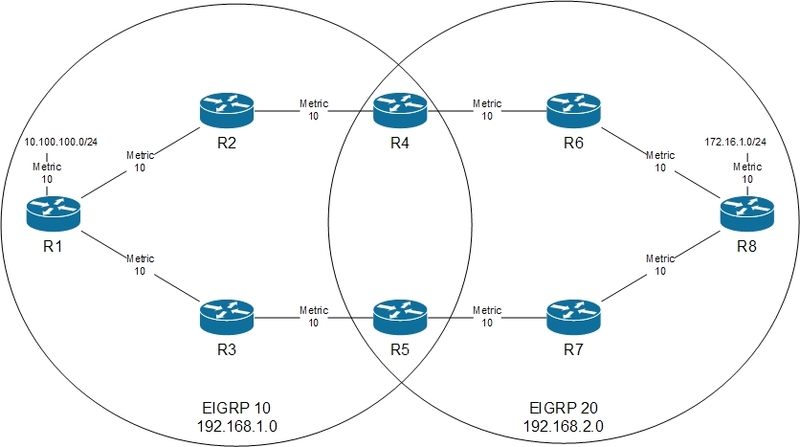 Assuming that both R4 and R5 were configured with the command redistribute eigrp 10, what is the reason why only a single route is being redistributed from EIGRP into OSPF? The subnets parameter is missing. The route-map parameter is missing. The metric-type parameter is missing. The metric parameter is missing. Refer to the figure. A network engineer is brought into a client network to configure the EIGRP stub feature on all appropriate devices. On which of the devices labeled in the figure should the engineer configure the EIGRP stub feature? Refer to the figure. What is the feasible distance from R5 to R1 that is used by EIGRP? Refer to the figure. What does the information shown indicate about the route to the 10.10.10.0/24 network? The current successor was through the Serial1/2 and S1/3 interfaces and both have failed. The new successor will be though the Serial1/0 interface. The new successor will be though the Serial1/2 or Serial 1/3 interface. The current successor was through the Serial1/0 interface and has failed. Which of the following LSA types are used to calculate the best routes for all routes inside an OSPF routing domain? 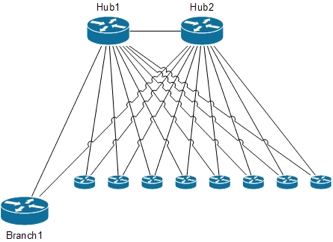 Which of the following is true regarding redistributing routes into the backbone area of OSPF? OSPF creates Type 7 LSAs to represent each redistributed network. OSPF creates Type 5 LSAs to represent each redistributed network. The redistributed routes are noted by “OE” in the routing table. By default, OSPF redistributes these routes as External Type 1. The metric option must be used with the redistribution command whenever redistributing routes in OSPF. Which of the following is a type of NAT IP address that is a public address referencing inside device? Which of the following interface commands configures a static IPv6 address on a router using EUI-64? Using the following parameters, what order does BGP use to determine the router ID? a. Highest numeric IP address of any loopback interface. b. Highest numeric IP address of any active physical interface. c. IP address configured with the bgp router-id subcommand. 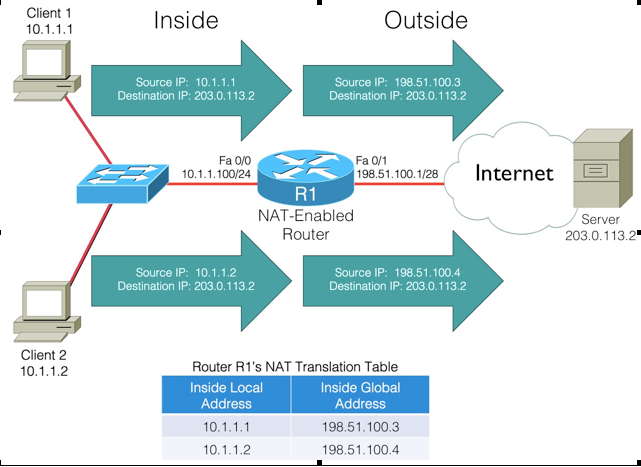 What is the first step one must do in order to configure generic routing encapsulation (GRE) over IPsec on a Cisco router? Which of the following “owns the process” with respect to address assignments for IPv6 and IPv4? Which set command will modify the default OSPF external-type? Routers R1, R2, and R3 have been configured with the commands router eigrp 1 and network 10.1.0.0 0.0.255.255. Which commands would display the contents of the network configuration commands for each routing process and list the neighbor IP addresses? Refer to the diagram. R1 and R2 are eBGP peers. R2, R3, and R4 are full mesh iBGP peers and are also running an IGP. The only routes in R4’s routing table are those within AS 200. R4 does not have the 10.0.0.0/8 network in its routing table. What is the problem? R4 does not install the 10.0.0.0/8 network in its routing table because R1 needs to use the eBGP multi-hop option to reach R4. R4 does not install the 10.0.0.0/8 network in its routing table because the no synchronization command has not been configured on all of the routers in AS 200. R4 does not install the 10.0.0.0/8 network in its routing table because it does not have a route to the next-hop address, 172.30.1.1, in the BGP table. Which of the following LSA (link-state advertisement) types is created by ASBRs for external routes injected into OSPF? Refer to the diagram. R1 and R2 are eBGP peers. R2, R3, and R4 are full mesh iBGP peers and are also running an IGP. The only routes in R4’s routing table are those within AS 200. R4 does not have the 10.0.0.0/8 network in its routing table. Which of the following commands would solve this problem? Which of the following allows someone to measure ongoing network behavior and modify routing operations such as stopping PBR logic? Which of the following BGP neighbor states is when the TCP connection has been completed, but no BGP messages have yet been sent to the peer? How does BGP prevent routing loops? BGP creates a link-state tree similar to OSPF. Through the use of hold-down timers. If the router receives a BGP advertisement that contains its AS number, that route is ignored. If the router receives a BGP advertisement that contains its own Router ID, that route is ignored. The EIGRP metric weights command sets how many different variables? Which rule states that a BGP router should not advertise to external neighbors, destinations learned from inside BGP neighbors unless those destinations are also known via an IGP? Which of the following statements is true regarding the following configuration? Because a default-metric value has been specified, OSPF 2 routes will ignore the ones specified in the redistribute ospf 2 command and will use the default-metricvalues instead. The default-metric command is used only for internal EIGRP routes that originated within the EIGRP routing domain. The redistribute ospf 1 command is ignored because the metric value is not specified. The value “1500” used by both the redistribute ospf 2 and default-metriccommands refers to the MTU. Which command displays the statistics for the number of packets matching a route map? Which of the following BGP attribute is a numeric value that is communicated throughout a single autonomous system to influence the choice of best route for all routers in that autonomous system? Which of the following LSA (link-state advertisement) types is created by ASBRs inside an NSSA area? What neighbor state would a router be in if it receives a Hello from a neighbor but does not see its own Router ID in the message? Router R1 is the DR and Router R2 is the BDR on the LAN. Router R3 has just booted up and has a higher OSPF interface priority than R1 but not R2. What role will R3 assume? R3 will immediately become the DR.
R3 will immediately become the BDR. R3 will immediately become a DROTHER. R3 will become the DR after the Dead Interval expires on the DR.
R3 will become the BDR after the Dead Interval expires on the BDR. When running the show ipv6 eigrp neighbors command, which of the following are displayed? What is the result of the following commands? R1 will deny the 192.168.1.0/24 LSA. This LSA will not be entered into the LSDB. R1 will accept the LSA for 192.168.1.0/24 but the SPF algorithm will not add this network to the routing table. R1 will filter the 192.168.1.0/24 LSA, denying it to be sent into all other areas. All other LSAs will be permitted. R1 will filter the 192.168.1.0/24 LSA, denying it from any area that it is received from. All other LSAs will be permitted. Which IP Security (IPsec) feature ensures data is not modified in transit? Which method can be used for a host to learn the prefix part of its IPv6 address using NDP? Which of the following 16-Bit ASN assignment category from IANA is reserved for use in documentation in BGP? Refer to the figures. Assuming that the configuration shown in the second figure is configured on R4, which of the EIGRP routes are advertised into OSPF? Which of the following is not a step EIGRP follows to add routes to the IP routing table? Which OSPF LSA type is used by the Designated Router to relay subnet and connected subnet interface information? Refer to the figure. A network engineer is trying to test an OSPF configuration in a lab but cannot get the OSPF neighborship to establish. Which answer correctly lists the part in this configuration that would prevent the OSPF neighborship from establishing? The OSPF process-ID must be the same throughout for the OSPF domain. The OSPF hello-interval must be the same throughout for two OSPF speakers to become neighbors. The OSPF priority of 255 prohibits neighborships from establishing. The OSPF router-IDs must be the same throughout for the OSPF domain. Refer to the figure. A device configured as shown would be using what BGP router-id? 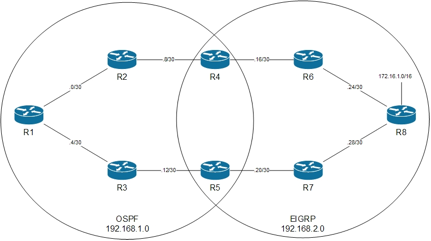 When redistributing OSPF into EIGRP, what table is used to redistribute routes from? The Internet Assigned Numbers Authority (IANA) assigns one or more IPv6 address ranges to each of the Regional Internet Registries (RIR), which consist of how many at the time of publication? Which of the answers correctly shows the EIGRP command that is used to alter the metric to only use the delay of the path between a device and the destination network? In the topology, two clients, with private IP addresses of 10.1.1.1 and 10.1.1.2 want to communicate with a web server on the public Internet. The server’s IP address is 203.0.113.2. Router R1 is configured for NAT. As an example, router R1 takes packets coming from 10.1.1.1 destined for 203.0.113.2 and changes the source IP address in the packets’ headers to 198.51.100.3. When the server at IP address 203.0.113.2 receives traffic from the client, the server’s return traffic is sent to a destination address of 198.51.100.3. There are two main rules that must be followed when abbreviating IPv6 addresses: The omission of leading zeros is always valid and the representation of multiple consecutive zeros can be substituted with a ::, but only once. The syntax of the command needed to do this is metric weights tos k1 k2 k3 k4 k5 with the k1 variable controlling the bandwidth component of the EIGRP metric. There is a lot of information that can be gathered from this command (show ip protocols), including that EIGRP redistributed routes (all of them) will use a metric of 50. When redistributing into EIGRP from another EIGRP autonomous system, the metric from the neighboring autonomous system will be redistributed. To use uRPF, Cisco Express Forwarding must be enabled on the router. The easiest way to both limit the scope of EIGRP queries and to limit Spoke routers from advertising remotely learned EIGRP routes is by using EIGRP stub routing. When determining the router-id to use, BGP will choose based on the following order: Configured (with the bgp router-id command), highest Loopback (IP address), and highest other interface (IP address). Because EIGRP uses different administrative distances for internal and external routes, many common multihomed redistribution problems are resolved before they start. If the subnets parameter is not included as part of the OSPF redistribution configuration. than only networks that exist in the routing table that are using classful boundaries will be redistributed. When configuring the EIGRP stub feature, the only configuration required is entered at the stub router itself and not on any other nonstub router. The feasible distance is the best metric that exists between a source and destination. Using this figure the best metric between R5 and R1 is R5 -> R2 -> R1, which has a feasible distance of 20. The Figure shows that the successor for the route to 10.10.10.0/24 has failed (which existed through Serial 1/0) and EIGRP is querying its other neighbors for an alternative route. OSPF uses Type 1, 2, and 3 LSAs to calculate the best routes for all routes inside an OSPF routing domain. In a later chapter, we explore Types 4, 5, and 7, which OSPF uses to calculate routes for external routes (routes redistributed into OSPF). For each network or subnet redistributed into OSPF, OSPF creates a Type 5 LSA. Type 7 LSAs would be created when the networks are redistributed into an NSSA area. Redistributed routes in the IP routing table will be preceded with “E1” or “E2.” The default is External Type 2 (E2). The cost of an External Type 2 route is always the external cost, irrespective of the interior cost to reach that route. If a value is not specified for the metric option, and no value is specified using the default-metric command, the default metric value for OSPF is 20 for IGP routes and 1 for BGP. For all other routing protocols, the metric option is 0 and is therefore required. Inside global NAT IP address is a public IP address referencing an inside devices. The correct interface command is ipv6 address 2001:0:0:14::/64 eui-64. This command requires the IPv6 prefix followed by the eui-64 parameter. BGP uses the same process as EIGRP and OSPF in selecting the router ID. The order of precedence is 1. The IP address used in the bgp router-id router subcommand, 2. The highest IP address of any loopback interface, and 3. The highest IP address of any physical interface. The first step when configuring a GRE on a Cisco router is to create or configure a virtual tunnel interface in global configuration mode with the interface tunnel id command. Steps two through four are configuring the interface IP address, specifying the tunnel source address, and specifying the destination of the tunnel. The same organizations handle this address assignment for IPv6 as for IPv4. The Internet Corporation for Assigned Network Numbers (ICANN, www.icann.org) owns the process, with the Internet Assigned Numbers Authority (IANA) managing the process. IANA assigns one or more IPv6 address ranges to each Regional Internet Registry (RIR), of which there are five at the time of publication, roughly covering North America, Central/South America, Europe, Asia/Pacific, and Africa. These RIRs then subdivide their assigned address space into smaller portions, assigning prefixes to different ISPs and other smaller registries, with the ISPs then assigning even smaller ranges of addresses to their customers. The default OSPF external-type is Type 2. The cost of an External Type 2 route is always the external cost, irrespective of the interior cost to reach that route. External Type 1 routes include the cumulative cost of the route through the OSPF domain similar to interarea and intra-area routes. The command show ip protocols lists the contents of the network configuration commands for each routing process and lists the neighbor IP addresses. When R2 advertises the 10.0.0.0/8 network to iBGP peer R4, unlike eBGP iBGP leaves the next-hop address of 172.30.1.1 unchanged. If R4 does not have a route to the 172.30.1.0/30 network, it will not install the 10.0.0.0/8 network in the IP routing table. The solution is for R2 to advertise the 172.30.1.0/30 network using its IGP or to use the next-hop-self option. OSPF LSA Type 5 is created by ASBRs for external routes injected into OSPF. When R2 advertises the 10.0.0.0/8 network to iBGP peer R4, unlike eBGP iBGP leaves the next-hop address of 172.30.1.1 unchanged. If R4 does not have a route to the 172.30.1.0/30 network, it will not install the 10.0.0.0/8 network in the IP routing table. The solution is for R2 to advertise the 172.30.1.0/30 network using its IGP or to use the next-hop-self option. The correct use of the next-hop-self option is the eBGP peer to use the command neighbor 192.168.2.2 next-hop-self with it iBGP peers. The correct answer is IP SLA. Route maps using set ip precedence is incorrect as this command sets precedence value in the IP header. PBR using ip local policy route-map command is incorrect. ip local policy route-map command applies PBR to packets generated locally by the router. 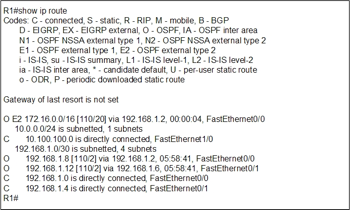 Route maps using set ip tos is incorrect as this command sets the tos value in the IP header. The BGP neighbor state where the TCP connection has been completed, but no BGP messages have yet been sent to the peer. BGP is a path vector routing protocol so it does not use any sort of SPF or link-state tree. Hold-down timers are used by RIP to help prevent routing loops but are not used by BGP. BGP uses a method by which if the BGP router receives a BGP advertisement with its own ASN, then it knows that it has already received (or originated) and propagated that advertisement. The BGP router will therefore ignore that BGP advertisement. Another loop prevention mechanism is sometimes referred to as the BGP split horizon rule. This states that when a router learns routes from an iBGP peer, that router does not advertise the same routes to another iBGP peer. EIGRP calculates its integer metric, by default, using a formula that uses constraining bandwidth and cumulative delay. You can change the formula to use link reliability, link load, and even disable the use of bandwidth and/or delay. To change the formula, an engineer can configure five weighting constants, called K-values, which are represented in the metric calculation formula as constants K1, K2, K3, K4, and K5. From a design perspective, Cisco strongly recommends against using link load and link reliability in the EIGRP metric calculation. Most shops that use EIGRP never touch the K-values at all. However, in labs, it can be useful to disable the use of bandwidth from the metric calculation because that simplifies the metric math, and makes it easier to learn the concepts behind EIGRP. The metric weights command sets 5 variables (K1 through K5), each of which weights the metric calculation formula more or less heavily for various parts of the formula. Mismatched K-value settings prevent two routers from becoming neighbors. This rule is known as BGP Synchronization. BGP Synchronization can be disabled when all transit routers inside the AS are running fully meshed IBGP. Internal reachability is guaranteed because a route that is learned via EBGP on any of the border routers will automatically be passed on via IBGP to all other transit routers. The default-metric values are used only if a redistribute command does not include those values using the metric option. If the metric option is used, the default-metric command is ignored. The default-metric command is used to assign metric values to external routes redistributed into the routing protocol, in this case EIGRP. If a value is not specified for the metric option, the default-metric values are used. The “value 1500 refers to the MTU, with the preceding values relating to bandwidth, delay, reliability and load. Show ip policy displays the route map and interface used for policy routing but no statistics. debug ip policy displays the ip policy routing activity but no statistics. 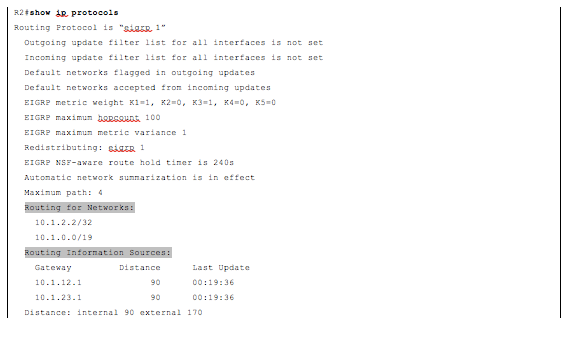 show ip policy-list display information about a configured policy list and policy list entries but no statistics. The show route-map displays the number of packets and bytes that have been filtered by policy routing. The BGP attribute local preference (local_pref) is a numeric value, ranging from 0 through 232 – 1, set and communicated throughout a single autonomous system for the purpose of influencing the choice of best route for all routers in that autonomous system. LSA Type 7 is created by ASBRs inside an NSSA area. The router’s interface would be in the INIT state until it receives another Hello message with its own Router ID. At that point the interface would enter the 2WAY state. A router with a higher OSPF interface priority does not force the DR or BDR election. As shown here, the show ipv6 eigrp neighbors command displays EIGRP process running, address, interface, hold and uptime, SRTT, RTO, Q count, and sequence number. The distribute-list in command will not filter OSPF LSAs, and it will not prevent link-state packets from being propagated to other routers. It can be used to prevent routes from being entered into the routing table. Note: The distribute-list out command works only on the routes being redistributed by the Autonomous System Boundary Routers (ASBR) into OSPF. It can be applied to external type 2 and external type 1 routes, but not to intra-area and interarea routes. Data integrity ensures that data is not modified in transit. For example, routers at each end of a tunnel could calculate a checksum value or a hash value for the data, and if both routers calculate the same value, the data has most likely not been modified in transit. Stateless autoconfiguration uses NDP (Neighbor Discovery Protocol) to discover the IPv6 prefix from a router that shares the same link. This process uses ICMPv6 messages called an NDP Router Advertisement (RA) from the router. The 16-bit ASN assignment categories for IANA with a value or range of 64496 though 64511 are reserved for use in documentation for BGP. Like access lists, prefix lists have the same implicit deny at the end of all lists; this prohibits any other routes from being redistributed. The three general steps to add routes to the IP routing table in EIGRP are neighbor discovery, topology exchange, and choosing routes. The OSPF Link State Advertisement type 2 is used by the DR to relay information related to a transmit area. When redistributing routes, a router uses the routing table to source routes to be redistributed. If they are not in the routing table, they will not be redistributed regardless of whether they are in any routing protocols specific table. Public IPv6 addresses are grouped (numerically) by major geographic region. Inside each region, the address space is further subdivided by ISPs inside that region. Inside each ISP in a region, the address space is further subdivided for each customer. The syntax of the command needed to do this is metric weights tos k1 k2 k3 k4 k5 with the k3 variable controlling the delay component of the EIGRP metric. Using the following parameters, what order does BGP use to determine the router ID? a. Highest numeric IP address of any loopback interface. b. Highest numeric IP address of any active physical interface. c. IP address configured with thebgp router-idsubcommand. Which of the following owns the process with respect to address assignments for IPv6 and IPv4? Refer to the diagram. R1 and R2 are eBGP peers. R2, R3, and R4 are full mesh iBGP peers and are also running an IGP. The only routes in R4s routing table are those within AS 200. R4 does not have the 10.0.0.0/8 network in its routing table. What is the problem? Refer to the diagram. R1 and R2 are eBGP peers. R2, R3, and R4 are full mesh iBGP peers and are also running an IGP. The only routes in R4s routing table are those within AS 200. R4 does not have the 10.0.0.0/8 network in its routing table. Which of the following commands would solve this problem? Are you sure you are ready to grade your quiz?